Ola Onabule to release 'SEVEN SHADES DARKER'. 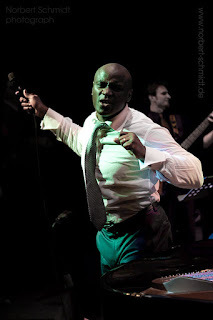 2011 will see the release of British Nigerian singer and songwriter, Ola Onabule's 7th studio album entitled 'SEVEN SHADES DARKER'. The album features 14 tracks that will only solidify Ola's growing reputation as one of the finest singer songwriters writing today. Grooves undoubtedly rooted in the Soul and Blues of the late sixties and early Seventies make an unlikely but easy peace with mournful, complex African melodic lines. On other tracks, wailing distorted guitars cling to the helter-skelter ride of poly-rhythmic time signatures that seem to unsettle and soothe the ear in equal measures. Seemingly conventional 4/4 grooves beguile with inviting familiarity whilst slipping potent lyrical nuggets under the radar of our assumptions. Ballads are new requiems, odes to the passing of loved ones, Funky jaunts document the ebbing away of precious time, and deal with jealousy, cowardice, loss of identity and the world through the eyes of an unwanted visitor is set to the galloping gait of an african church hymn. Ola, in very fine voice, twists and turns at every step, eluding definition and revelling in all his gifts like a child, celebrating this rare feat in the modern recording era of a seventh album! What sets “Seven Shades Darker” apart is Ola’s lyrical sensibility, poetic in tone and attuned to the issues of the day; as Ola puts it himself, “Though my music is of a different idiom, I write with the heart of a folk songwriter and the desire for my lyrics to be heard and read.” While he deals astutely and compassionately with such personal topics as the loss of a loved one (“Gone”), it is on Ola’s more socially- and globally- minded tracks that his words shine brightest. “Fast” gives voice to frustration with our leaders’ inaction and empty words, while “A Name” casts a light on the labels and allegiances that keep people apart. Ola’s African roots underlie much of the album, taking centre stage in “Great Expectations”, a soulful rumination on the hope that lead us from home, and the reality that we’re met with. and leaving behind an education in law, then choosing to work outside the system of big record labels, he has gone on to build his own studios, set up his own label, and tour tirelessly with his band. Now a regular presence at some of the world’s premier festivals and concert halls, Ola looks forward to building greater inroads into the Americas and Asia while hoping to play a modest role in raising awareness of the issues afoot in our globalizing world! January 2011 saw Ola perform with the Deutsche Film Orchestra at the NIKOLAISAAL in Potsdam to include special arrangements from the new album SEVEN SHADES DARKER. The concert was filmed for a documentary being made by a British documentary maker that is already in production. OLA is a frequent traveller to international destinations to perform at international Jazz Festivals which have included the main stage of The Montreal Jazz Festival, Vancouver Coastal Jazz Festival, Victoria Jazz Festival, Edmonton Jazz Festival in Canada, Umea Jazz Festival Sweden, Blueballs Music Festival Switzerland, Edinburgh Fringe Festival, Leverkusen Jazz Festival, Silda Jazz Festival of Norway, The Duke Ellington Jazz Festival at The Kennedy Center in Washington, Ingolstadt Jazz Festival and Aalener Jazz Festival, as well as many of the world's most famous jazz venues including Ronnie Scott's, Blue Note, New York, Joe's Public Theater and Quasimodo's in Berlin. 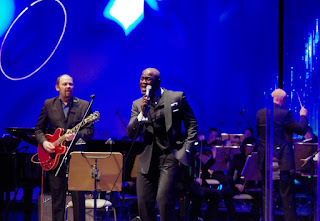 Ola also appears at concert halls including venues such as the Queen Elizabeth Hall in the UK, and special appearances with Big Bands and Orchestras. Ola has opened for artists such as Gladys Knight, Roberta Flack, Seal, Al Jarreau, Diane Reeves, Patti Labelle and many others. He has a US manager who is working towards a release for the album in the States and Canada but I would like the album to be with the right label in Europe.